There are 3 preferable ways to read XML document. XMLDocument Class - It allows to insert, update, delete or move a node. XMLTextReader Class - It allows read data in fast forward-only manner. XMLValidatingReader Class - It allows to validate XML document against Document Type Definition (DTD), XML Schema definition(XSD) and XML Data Reduced(XDR). forward-only access to XML data. Choosing between XMLDocument, XMLTextReader and XMLValidatingReader Class. You want to perform operation like Insert, Update and delete. You want to read data in forward-only manner. You want to validate XML document against DTD, XSD and XDR. XML is a standard by which two incompatible system can communicate. XML DOM works with XML data in your application. It is used to read, write and modify XML document programatically. This node type is the container for all the nodes and is also known as the document root. This node type represents element nodes. This node type represents the attributes of an element node. This node type represents the text that belongs to a particular node or to an attribute. Every XML Document contains a single root element that contains all other nodes of the XML Document. Here <employees> is a root element. XML Element Attribute further describe the Record details. Here <FirstName> etc are XML Element Attributes. What is XML Document Object? XMLDocument provides an in-memory representation of and XML document. The Microsoft Best Practices Analyzer for Windows SharePoint Services 3.0 and the 2007 Microsoft Office System Best Practices Analyzer programmatically collects settings and values from data repositories such as MS SQL, registry, metabase and performance monitor. Once collected, a set of comprehensive ‘best practice’ rules are applied to the topology. Administrators running this tool will get a detailed report listing the recommendations that can be made to the environment to achieve greater performance, scalability and uptime. Windows vista has problem of Icon disappear from System Tray. So, to make Important System Icon in sytem tray back in windows vista, you need to delete two entries from registry. Navigate to the key "HKEY_CURRENT_USER\Software\Classes\Local Settings\Software\Microsoft\Windows\CurrentVersion \TrayNotify"
Delete the values "IconStreams" and "PastIconsStream"
To make the change refresh, Open Task Manager (ctrl+shift+esc) and End Task the "explorer.exe" and Add again "explorer.exe" from File menu - New Task. For understanding each step in depth follow this link. Before Adding user make sure that User is already available in Windows Server 2003 - "Active directory users and computers"
Ok, lets take a quick overview on adding User Group to Active Directory in Windows Server 2003. Step1: Start Menu - Control Pannel - Administrative Tools and in it Active directory users and computers. Step2: Drill the Active Directory User and Computers and in it select the server, example on my PC i have named server as "MyServer" so need to drill "MyServer"
Step3: Right Click user directory and select New from popup menu and click user, to create new user. And you are done creating user. Note: You have created user in windows server 2003, to make this user access sharepoint site it is necessary to assign proper permission. So now logged in to sharepoint site as administrator and add user to visitor group as created in previous post. Now, lets add user in to "Visitor Group" as created in previous post. ok, now before adding already available user, lets enter some anonymous user and look what happen. - As obvious, it will display me error, No exact match was found. So if you want "sachin tendulkar" user to be added, follow the step as describe above. Now, lets add user already created. i.e. "Harsh Patel". - Two option to add, either write his email, name and click on check user button, so if user is available it would be underline, otherwise you can click browse button to search user and then add it. ok, lets click browse button and find user with name harsh and add it. After selecting valid user, its now turn to assign permission. - Give user permission directly. Now as we want to add him to "Visitor" Group already created we will choose from drop-down of Sharepoint User Group. Also check "Send Email" Check box if you want to send welcome email to user. And click ok to create user. Now, lets check whether user is created by opening Visitor Group. Thats it, we are done with creating user. - Created user in Windows 2003 Server. - Created user in Sharepoint and assign permission and adding it appropriate sharepoint user group. Before starting discussion, I would like to Thanks Uday Microsoft MVP for Sharepoint for sharing his knowledge in solving the error. Or do you recieve following error. There can be more ways this error can trouble, but let me share how this error occur while working with sharepoint. My PC, is one of the workgroup PC to connect to local network. Now to take advantage of sharepoint and to make it sharepoint server, I have turned my PC to Domain Controller and Installed Active Directory using DCPromo Command on command prompt. Domain Controller is first PC in network which controls sub domain. Example: DailyFreeCode.com can be said Domain Controller, while sub domain such as Forums.DailyFreeCode.com and Search.DailyFreeCode.com are domain under the domain controller, for more details and indepth knowledge please refer "Active Directory Concept" and "Domain Creation Concept" in windows 2003 server. How to turn your PC to Domain Controller? You can make your PC to Domain Controller on Windows 2003 Server by running command "DCPromo" on command prompt. A wizard will open which guide you step by step in creating your PC to Domain Controller. Ok, so now back to our problem. It was obvious that after creating your PC to Domain Controller this error is likely to occur as default setting are changed and that also need to configure. Note: I haven't considered steps for backup data. Remove SQL Server with UnInstalling all Instances. Remove Virtual Directory from InetMgr (IIS) related to Sharepoint. Remove directory from c:\inetpub\wwwroot\wss\Virtual Directories and delete all directories under it. And Try opening sharepoint website, now it should work for you. Please pass your comment and suggestion to improve this steps as each time it not possible to delete all data, and it is also necessary to take backup before applying above step, so share your experience, Thanks. 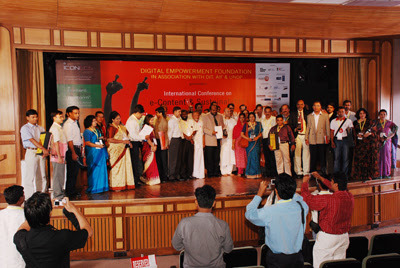 Microsoft’s Students2Business initiative with Government of Gujarat was awarded the Manthan award (http://www.manthanaward.org/) which is an Indian initiative by Digital Empowerment Foundation, to select and promote the best practices in e-Content and Creativity in India. It involves representatives from each state and union territory of India and visualizes the bridging of the digital divide and narrowing the content gap as its overall goal. The Students2Business program focuses on making the students more employable by providing them training on Microsoft technology by means of existing distance education infrastructure in the state followed by an evaluation, certification and an opportunity to work on projects/internships. Every year Microsoft recruits Student Partners (MSPs) from colleges across India. These are young technology enthusiasts who work as Microsoft’s representatives on their campuses - conducting trainings, sharing knowledge and motivating fellow students – and in turn they get access to latest technology tools, gain industry exposure and the chance to be interviewed at Microsoft. Lets Gets Started with Sharepoint Service 3.0 and MOSS 2007 with easy step by step lessons. What is Sharepoint Service from User prospective? From a Users perspective SharePoint is a way of making documents and folders on the Windows platform accessable over the web. The user visits the SharePoint Portal web page, and from there they can add documents, change documents & delete documents. Through this Portal, these documents are now available for discussion, collaboration, versioning and being managed through a workflow. Hence the name "Share-Point". Details about the document can be saved too, such as: who wrote it, when, for whom, its size, version, category or target audience. These can then be used to find the document through SharePoint's Search facility. Even documents not "in" SharePoint can be included in the search engine's index so they become part of the portal. All in all, it's a great way to get stuff up on the web for users with average technical skills, and for administrators to manage the content. What is Sharepoint Service from Administration prospective? Administering SharePoint mainly consists of setting it up, which is much easier than you expect, adding the content, which can be just dragging and dropping in whole directory structures and files, and then organinsing the files better by giving them categories or other metadata. This is done either throuhg the Web interface or through the SharePoint Client: a program what means you can access SharePoint as a Web folder and then right-click files to select options like "edit profile". Or add files by dragging them in individually or in bulk. Setting the security is also important, using NT accounts, either NT4 or Active Directory (or both in mixed mode) you can give users access to files/folders the same way as you do in standard Windows. Users can be grouped and the groups given access priveliges to help manage this better. Also SharePoint has 3 Roles that a User or Group can be given on a perticular item. Readers can see the item (ie document/file or folder) but not change it, Authors can see and edit items and coordinators can set security priveliges for the part of the system they have control over. Thus, you could set 12 different coordinators for 12 different folder trees, and they could manage who can do what within that area only! Good eh? What is Sharepoint Service from Technical prospective? Technically SharePoint illustrates neatly what Microsoft's .net strategy is all about: integrating Windows with the Web. Microsoft has previously made accessing stuff on a PC easier, (Windows) then on a network (NT) and now on the web (.NET). SharePoint is an application written to let a user access a web accessable directory tree called the Web Storage System. SharePoint was written with a set of technologies that allow the programmer to pass data, functions, parameters over HTTP, the web's medium. These are XML, XSL and SOAP, to name a few I understand the basics of! To the user it looks easy, like Hotmail, but everytime they click a button or a link, a lot has to happen behind the scenes to do what they want to do quicky and powerfully. Not as easy as you might think, but SharePoint does it for you. Accessing this Web storage system and the server itself is also done using technologies like ADO, CDO, PKMCDO, LDAP, DDSC, ADSC. More on these later. SharePoint is a great example of how the Internet Platform can be extended and integrated into an existing well adopted technology, Windows. • Approximately 1000 built in templates means full brand customisation is time consuming and expensive. How do I install Sharepoint on my computer? Create "Active Directory" with DcPromo command on Command Prompt. Google Page Rank of dotnetguts blog is updated from 3 to 4. What is InfoPath - Microsoft Office Infopath 2007 or 2003? Infopath can use to design a browser-compatible form template and publish it to a server that is running infopath form services. Users can then fill out forms that are based on your form template in a web browser or on a mobile device. In addition, Infopath Forms services provides a central location to store and manage form templates for your organization. Some Basics of Infopath that you should know. Where can I use Infopath? With InfoPath, you can simply develop Web Services "hooks" that allow data to be submitted to and retrieved from a variety of applications. Developers can use InfoPath to quickly create new, feature-rich user interfaces to those legacy applications. This process is both much faster and less expensive than the task of re-engineering the legacy application, and can result in a huge cost saving. You can transfer and re-use data with Infopath, as its base is XML and so its now easy to exchange data between two incompatible system. Broader usage scope, it gets easily integrable with other office product. example, you can easily export data to excel worksheet. Offline support, InfoPath forms don't have to be filled out while a user is connected to a network. Users can save forms to their computer, work on them offline, and then submit them to the corporate network when they are reconnected. For more on Infopath Advantage and How Infopath works with other Microsoft Office Product. For those who are using Free Mail Service provided by Godaddy.com can simply configure there outlook email as shown in following article. A wordwide SQL Server community www.sqlcommunity.com has been launched. This is a joint effort of Microsoft Employees, few MVPs and SQL Server experts. SQL Community to get instant help on SQL Topics from industry gurus. String Functions are used for manipulating string expression. Note: string expression should be passed within single quote. Len('') - Returns length of string. Lower('') - Convert all characters to lowercase characters. Upper('') - Convert all characters to uppercase characters. LTrim('') - Removes spaces from given character strings on left. Note: It doesn't removes tab or line feed character. RTrim('') - Removes space from given character strings on right. Trim('') - Removes spaces from given character strings from both left and right. SubString('') - Returns a part of string from original string. position - specifies where the substring begins. length - specifies the length of the substring as number of characters. 6 - Starting position of sub string from given string. 6 - It is no. of characters to be extract from given string, starting from 6. That is it will return "Ganesh" As ganesh start from 6th character upto 6 characters. Replace('') - Replace the desired string within the original string. SearchString - string which you want to replace. here, function search for every occurrence of High and replace it with Low. Right('') - extract particular characters from right part of given string expression. Example: select right('Think High To Achieve High',15) will return "To Achieve High"
This function will be helpful when you want particular characters from right part. Example: Let say i have social security nos. and i want to extract last 4 digit of it. Date and Time Functions are used for manipulating Date and Time expression. GetDate() - Returns current date and time of a system. Example: select GetDate() will return something like "2007-10-10 15:34:37.287"
DatePart and Abbrevation, which we will be using with DatePart, DateADD, DateDIFF function. DatePart() - Returns an integer representing a datepart of a date. select DatePart("day",GetDate()) will return 10.
select DatePart("hour",GetDate()) will return 16. DateADD() - Returns adds a date or time interval to a specified date. DateDIFF() - Returns difference between two specified dates. Note: If the end date is earlier than the start date, the function returns a negative number. If the start and end dates are equal or fall within the same interval, the function returns zero. You must pass valid start and end date otherwise you will receive error. Mathematical Functions are used for manipulating Mathematical expression. ABS() - Returns positive value of numeric expression. Ceiling() - Returns the smallest integer that is greater than or equal to a numeric expression. select Ceiling(-3.14) will return 3. Floor() -Returns the largest integer that is less than or equal to a numeric expression. Round() - Returns a numeric expression that is rounded to the specified length or precision. An interesting post made by Abhishek Kant, regarding How to open MS Office 2007 file without installing Office 2007 on your computer. same visual fidelity as the full version of Word 2003. This topic in the MSDN Library contains descriptions and quick overviews of some of the new features and enhancements in Visual Studio 2008. Ready to learn about all the ways that Visual Studio 2008 will make you more productive? Check out the videos on this regularly-updated page. Videos include some quick clips as well as in-depth training videos on the following subjects: client development, Web development, data access, Office development, mobile development, and team development. Testing Web applications is hard. Visual Studio Team System 2008 provides tools to automate testing, generate testing code, and make it easy to test Web applications and AJAX sites. In this topic, you will learn how to create a simple Web application, record and run a Web test, and bind data sources to your tests. Integrating your code with the rest of the system can be a painful experience; breaking the sacred nightly build has never been fun. Continuous integration is a response to these problems. Learn how to use Visual Studio Team System build features to integrate your code at each check-in and get feedback on your work as you complete it. Version control, build, and team workflow are key components of the daily lives of a developer. Understanding these concepts and how to make the best use of your tools is fundamental. Follow these short, step-by-step walkthroughs, and learn how Visual Studio Team System 2008 Team Foundation Server can help you in key scenarios, including version control, build setup, and team workflow features. Source of Information: MSDN Flash Microsoft Newsletter.